Anagh Coar and Sulby share short film honours! ← It’s Not Fair! “Oscar night” getting closer! Anagh Coar and Sulby schools were announced as joint winners of this year’s It’s Not Fair! 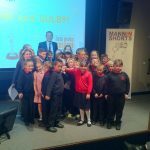 Primary Short Film competition with films that were described as “inspiring”, “insightful” and “excellently researched” at the prize presentation at the Manx Museum on 20th May 2014. The competition, run by the One World Centre and supported by Sure and Mannin Shorts, challenges primary school students to make short films of no more than four minutes on issues around global development and justice. Seven schools had films in the finals covering topics as diverse as a child’s right to education, fair trade, poverty and cyberbullying. All seven films were played to an appreciative audience which included representatives from the Department of Education and Children as well as the children’s families. Lieutenant Governor Adam Wood, patron of the One World Centre, was guest of honour and had the privilege of opening the golden envelope to announce the winners. His Excellency commended all the entrants for their creativity, talent and the breadth of learning they had undertaken. Anagh Coar’s winning entry concentrated on the right to education and featured the Send My Friend to School campaign. Sulby, who were also winners in the inaugural competition last year, looked at a range of global issues and were particularly effective in comparing their own lives with those of children in less developed countries. Both schools win a workshop session from Mannin Shorts and they will each have a six month’s share of the trophy.